The importance of editing tutorial was made for our January goody bag by Bjorgvin Benediktsson who runs the website www.audio-issues.com. We also promoted the the course Music production Strategies. Visit the website to find out more about this and his other courses. 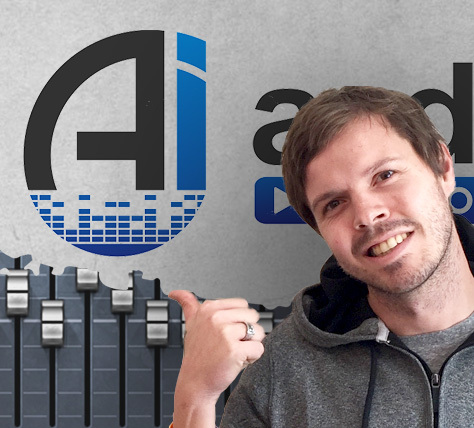 Audio Issue's goal is to teach you everything they can with their music courses about home recording, mixing music and producing your songs. to get him or her together. I don't actually believe in transforming someone's performance through editing to make them sound super tight. It’s not fair to your time as an engineer to fix all that and it's not fair to the drummer tothink that he or she is actually better than they are. It's especially notfair to the audience that hears the band on a CD or on Spotify or streaming that's really, really tight but then when they see them live they’re really bad. So with that said, I do believe in slight tweaks to make things tighter while retaining the feel of the authentic performance. So let's talk about drum editing that was recorded around a click. I've got a work in progress track herefor our upcoming album from my band ‘The long wait’. It's a track called ‘Drunken,lonely people’ and it's a great example of feel that moves around the click. Solet's listen to this just drum parts here real quick. So there's pretty good feel there. There's some push and pull because of the nature of the song and the personality of our drummer comes through but if I heard the click on its kind of hard to listen to because the push-pull is very evident, but the click doesn't feel like we do and the shuffley feel of the drums would be destroyed if I let the click dictate how I should feel the music so let's listen to that with the click here. So that's just kind of annoying to listen to. It’s really off-putting and it really detracts from the performance. So if you were to take this performance and edit it completely to the Click it would destroy the feel of it all. But that does leave us with a question of how do you go about adding to make sure you're getting a good feel that doesn't have an amateurish timing issues. Well, here's what I do, I listen to the track and I take notes on any inconsistencies that jump out at you. Music should feel good to listen to so as long as everything's grooving along nicely and you feel good listening to it, that’s a pretty good indicator that is a good performance. If you're still unsure, using the click as a guide can be beneficial. It doesn't exactly work in the situation we just listened to but for something more straightforward it can act as an anchor which you build the beat around and to be honest if there are timing inconsistencies in this performance I do use the Click as a guide to where the beats are because you want to be able to put them on the right beat so if the downbeat of a performance is off, I use the click to find where the actual performance should land and then everything else should take care of itself. So to me, the click is a guide, not a fixed point everything should be tied to. But in our case I tend to edit the rest of the instruments around the drums after listening to the drums and editing out any blatant timing issues. Say if the snare’s late in a bar or a fill doesn't quite fit into the pocket out of out of the measure, I kind of edit that together, but then I listen to the rest of the instruments and edit them around the feel of the drums. That will help you have a groovy foundation that's great for building the rest of your track around. So editing the instrument that stays the most consistently groovy throughout is a good bet. Usually for me, in our case, it's the drums but it can be any number of instruments depending on the style of the track, genre or instrumentation. So let's look at an example here, in this case I have a party here where the guitar is just slightly off, let me find that real quick. There you go, you hear that? It was slightly early so what I do in logic and every DAW software has something similar to this, I use the editing here so I just cut it all into slices and that means I can edit now just one hit into place. This is ‘flex-time’ in logic but I think most DAW’s have a version of this in a way. So let’s find that bit again. There we are, this is it here and it doesn't need a lot, it just needs a slight nudge and actually logic knows where the nudge should go. I just clicked it and it just kind of moved it there. Let’s listen to that again. See that's way better than this one here. That doesn't feel right to me so putting it over here makes it feel better. Lets’ take the click off so we can actually hear that feel. That's better and that's just an easy example for me to show you because it was in the perfect part of the song as I’m demonstrating this, but that's what I do with all the instruments. I listen to the bass and if the bass doesn't groove with the drums in any way I try to move the bass around so that it grooves consistently with the drums because once you have that great foundation you can really get a great mix, a great song great production. Editing helps take those ingredients you put into the song during the recording phase, it tightens them up together so that you end up with a really cool session that you can mix well without thinking everything sounds off because the timing is off. Now that we've looked at figuring out the foundation from a timing perspective, I also wanted to touch upon pitch correction from a performance perspective. I look at tuning as an editing tool because it helps take the recordings and make them tighter. In this case not in time but in tune but there are some things you should keep in mind when tuning vocals especially, because if you're too heavy-handed you'll kill the performance. I touch upon some of these issues in my editing package in ‘Quick Mixing’ with stock plugins on quickmixing.com but I'll share the most important parts here. Let's look at the song ‘Coming back’ again from our upcoming album. This track is incredibly important from a performance perspective because it's about real loss, deaths and heartbreak so kind of an important song to get right. None of the tools in your arsenal should trump getting the musical message across, so when you know you have an important song with a personal message you need to honour that in how you approach the production. So let's listen to the first verse right here. So this is a comped vocal from a few tracks because during the recording phase we ran it through quite a few times to get the right feel all the way through. I took notes and in logic you take note here but there's probably note software or notation devices in your software or whatever you use. I took notes on the most powerful overall performances that I then used as anchor performances that are good most of the way through but if there's a word or phrase that I think can be better I'll go hunting for in the other takes. So I know that vocal take 7 and 8 felt really good and then fourteen felt good too. Then I sort of used, I think seven was the best so I started with that one but I always compared seven and eight so let's look at that just in context here. So let’s compare take 7 and 8 just so you know what I'm talking about here. so I ended up with 7 for the first line because it's just slightly fuller and Liz's phrasing is slightly better with the music especially around this part right here. Her vibrato is also stronger and more controlled and then there's just an extra energy there that I can’t here and take 8. So that's what I do with the rest of the song, it's a little tedious but necessary for a great final product. For this project my comping rule was pick the vocal take that’s so hauntingly beautiful it almost makes you want to cry, but how when you end up with a great comp you might need to do some slight tuning tweaks if something is just slightly flat or sharp, so I'll show you that with this audio performance I comped here and you can take a listen to that. As you can see there's some slight pitch issues obviously and but this is just .006 off, which is so minuscule you really can't hear it that much. It’s only when it becomes a different note or somebody hits an actual wrong note not just slightly flat or sharp because everybody’s slightly flat or sharp. So you have to make sure you don't go overboard in fixing pitch because it can adversely affect the emotion of the singer. Flex pitch doesn't understand vibrato and emotional delivery so you need to tread that line. Basically the same applies to flex time as flex pitch. Those are logic terms but you know what I'm talking about. Only fix stuff that's obviously out of tune or doesn't groove in time at all. A little vibrato is just feel and the same goes for drumming around the click as I talked about earlier. So as an example listen to these two bits here. If I were to take this ‘me’ and set it to perfect pitch: that ‘me’ sounds sterile when it's put into perfect pitch for me. There’s a very subtle effect happening at the end of the line as she lets go of the note. That's diminished when you put it into perfect pitch because it's trying to hold that note in the same spot. It's similar when you put sustained and vibrato notes into perfect pitch because the vibrato performance the singer gave you is lessened, so it's not really the same performance anymore. If you spent all this time comping your vocals and then pitched them all perfectly you kind of destroyed what you just did. Here's another example in this final line here it's all over the place. This is negative point 33 flat but if you listen to it, it really doesn't sound bad at all. I think its sounds pretty beautiful. So if you were to take this whole performance and put it into perfect pitch and listen to that: then listen in its original pitch to compare. So if you put it into perfect pitch I feel like it ruins that performance. There’s a natural delivery between all those jumps and it's completely eliminated when you put into perfect pitch, so there's less character in the voice, so keeping the performance in mind at all times when you're editing and/or tuning is crucial. Let's recap and tie it all together. When you start to edit find the instrument that's most consistently groovy and edit everything else around that. Use a click as a guide to the performance, not as the boss of everything. Use it to anchor the beat down and have inconsistent timing but don't edit out the performance just to make it look good on the grid. Use comping to create a performance that's better than any single take. Take down notes during the recording faze to use during the editing process and finally use pitch correction the same way you would use time correction. Only edit out things that are blatantly out of time or tune. Thinking that pitch autocorrect knows what's going on in the performance is dangerous and can deeply diminish the impact of the vocal delivery. You can’t just tune everything perfectly but you can tune things to fit better.